As Beijing is experiencing the coldest winter in 30 years, hospitals across the city are dealing with more patients. The long existing problem of medical service shortage is getting prominent again. Patients complain it so hard to get registration in these top level hospitals in the capital, while doctors are under the huge pressure of extra workload. The authorities have been working hard to solve the problem and more effort is needed this year. 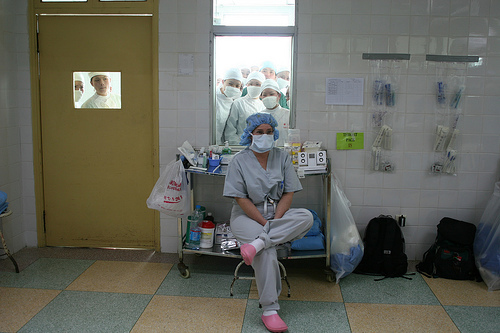 In some top level hospitals in Beijing, many patients complain it's hard to get a chance to see senior doctors. "It's very hard to get registered to see senior doctors at the hospital. Early every morning, I started to wait in front of the registration office, but I still could not get registered. Finally, I had to spend several hundred yuan to buy a registration ticket from a scalper." "To get a registration ticket in the hospital is extremely difficult. The number of doctors is far from adequate." When patients complain about their difficulty in getting medical services, doctors say they are under great pressure of increased workloads. Lu Hai is a senior doctor at Beijing Tongren Hospital. He usually receives more patients than he can see. "Actually chief doctors like me are required to see 15 outpatients within half a day, but, I have to see more than that, as there are many more extra registrations from the patients. It's very common for me to see 50 to 60 patients." According to chief nurse Zhou Lijuan, Lu's colleague, although doctors like Lu Hai have to do so much extra work each day, it still falls short of meeting the demands of patients. "These patients who failed to get registration tickets often get angry and ask us why we didn't give them extra registration opportunities, and many of patients complain because they have no idea about the doctors' work and schedule. For example, today doctor Lu receives outpatients in the morning, but in the afternoon, he is scheduled to carry out three inpatients operations. As these inpatients are asked to stop eating and drinking several hours before the operation, the doctor has to be on time for their operations, that's why he has to finish his consultation with outpatients on time at noon." In order to ensure the operations are done on time in the afternoon, Lu Hai stays in his consulting room from 8:30 am right through to 2:30 pm. Wang Dongxuan, an intern doctor in the hospital says many doctors in the hospital don't drink water when they receive patients, so that they can avoid going to the toilet and save time for more patients. Beijing has 25 percent of the country's medical resources, and patients from all over China come to Beijing to seek medical treatment. That only makes the situation worse. How to make better use of the limited medical resources in these top level hospitals? Medical reform is absolute necessary. Beijing has begun implementing its program of public hospital reforms since July 2012. The Beijing Friendship Hospital eliminated its 15 percent drugs mark-up, and introduced a medical care service fee which various according to the seniority of doctor. The measure aimed to encourage more patients seeing general practitioners, rather than senior physician or specialist with rising cost. The Peking Union Medical College Hospital, another renowned general hospital in Beijing, has started a 24-hour appointment registration service since August 2012, to ease the morning stress of high numbers of registrations. In addition, there are also some top level hospitals strengthening cooperation with the lower level hospitals or community healthcare centers, so that patients with chronic diseases could get medical treatment in these institutions near their home, rather than competing for medical service with those patients in critical condition in top level hospitals. Mao Yu, deputy director of the Beijing Hospital Authority says results at these public hospitals are looking good so far. "First, through public hospital reform, patients' expenditure for qualified medical service has been lowered. Second, patients have become more satisfied with the medical service, as communication between patients and medical workers has been increased. In addition, big changes have been seen in hospital management, such as position management and performance management being implemented in public hospitals." Although these efforts have seen some results, it's far from cutting the queue of patients in top hospitals.